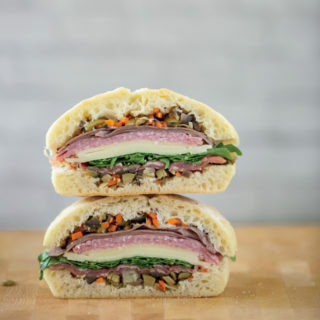 Skip carryout and build your own delicious New Orleans-inspired muffuletta. The olive salad truly takes it up a notch. In a large bowl, add the chopped olives, artichoke hearts and carrots. Sprinkle in basil, oregano, pepper and minced garlic. Pour in olive oil and red wine vinegar, and toss until mixture is well combined. Set aside. Spoon and spread the olive mixture into the bottom of each half of bread. Take the bottom half and layer meats and cheese slices on top of olive mixture. Take the top half and add arugula. Carefully reunite each of the bread halves to make a single loaf. Wrap the muffuletta tightly with plastic wrap and refrigerate under the weight of a heave cast-iron skillet for up to eight hours. To serve, cut into wedges. Feel free to add your favorite deli meats and cheeses.